This article is a short summary of Super Mario Maker 2. 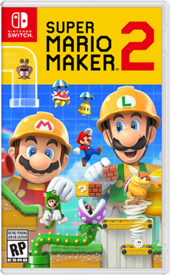 Super Mario Maker 2 is a level designing and editing game and a follow-up to the Wii U title Super Mario Maker, to be released for Nintendo Switch in June 2019. As with the original, Super Mario Maker 2 allows players to create their own 2D side-scrolling Super Mario stages using a variety of different elements and styles. Among the new additions are elements such as slopes, new level themes such as jungle and ice areas, and the option to create stages in the style of Super Mario 3D World. ↑ 1.0 1.1 Super Mario Maker 2 - Announcement Trailer - Nintendo Switch. Nintendo (YouTube; February 13, 2019). Retrieved February 13, 2019. ↑ SUPER MARIO MAKER 2 [Nintendo Direct 2019.2.14]. Nintendo 公式チャンネル (YouTube; February 13, 2019). Retrieved February 13, 2019. ↑ Super Mario Maker 2 - Announcement trailer (Nintendo Switch). Nintendo UK (YouTube; February 13, 2019). Retrieved February 13, 2019. ↑ Nintendo Direct - 14.02.2019. NintendoAU (YouTube; February 13, 2019). Retrieved February 13, 2019. This page was last edited on 14 February 2019, at 08:29.